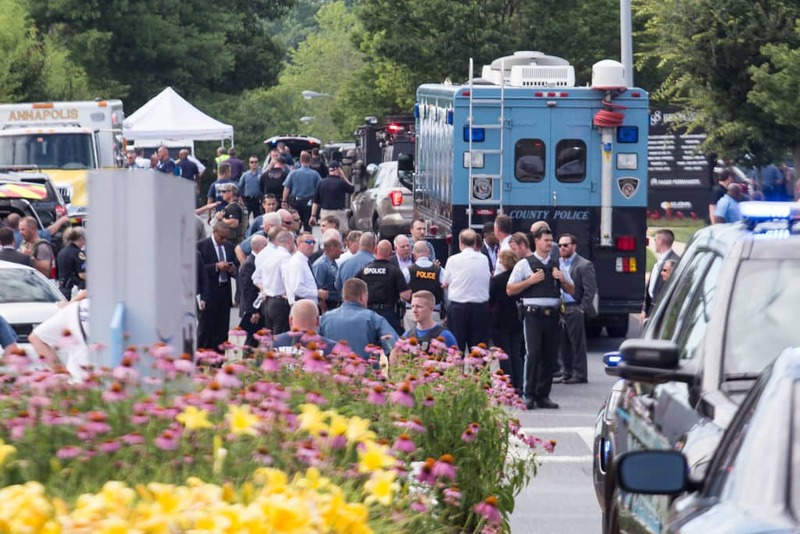 At least five people were killed and several others were injured on Thursday after a shooting at the offices of the Capital Gazette, a daily newspaper published in Annapolis, the capital of Maryland. The gunman allegedly fired through a glass door and sprayed the newsroom with gunfire. 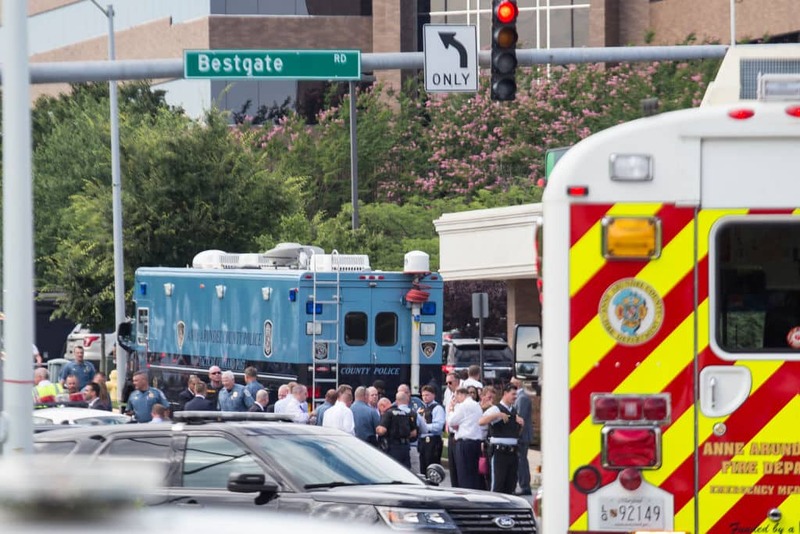 Around 170 people were inside the building at the time of shooting and police said that the shooter was using a "long gun" and they recovered what appeared to be an explosive device, according to a report in The Baltimore Sun, which owns the Capital Gazette. The suspect is reportedly a white man in his 20s and was using a shotgun, a TMZ report claimed. The authorities were at the scene "within 60-90 seconds" of the gunman opening fire. Capital Gazette staffers posted a number of distressing eyewitness accounts to Twitter as the shooting unfolded. A reporter for the Capital Gazette, Phil Davis, tweeted that a "gunman shot through the glass door to the office and opened fire on multiple employees." He said several people were killed. "There is nothing more terrifying than hearing multiple people get shot while you're under your desk and then hear the gunman reload," Davis said. Anthony Messenger, who describes himself as an intern at the newspaper, posted on Twitter: "Active shooter 888 Bestgate please help us." The Capital Gazette is located in a four-story office building in Annapolis, the capital of Maryland. Police were also at The Baltimore Sun newsroom in Baltimore. They said there was no threat on the Sun, and that their presence was a precaution. County Sheriff Ron Bateman told Fox News a suspect had been taken into custody. Sheriff Bateman said, "One of my deputy sheriff K9 handlers made an apprehension of a suspect. It is an active investigation, it is unfolding as we speak." Kalani Gordon, a senior editor at the Baltimore Sun, which owns the newspaper, posted on Twitter: "A shooting has occurred at the Capital Gazette in Anne Arundel County, a paper that is owned by The Baltimore Sun, according to reports from Gazette staff." The Baltimore Sun earlier tweeted: "We are investigating reports of an incident at the Capital-Gazette building in the 800 block of Bestgate Road in Annapolis. We will share details as we confirm them." "Absolutely devastated to learn of this tragedy in Annapolis," Maryland Governor Larry Hogan said. "Please, heed all warnings and stay away from the area. Praying for those at the scene and for our community." Agents with the ATF were on the scene in Annapolis to provide support to local law enforcement, said Amanda Hils, a spokeswoman for the federal agency. ATF can help with tracing weapons, conducting interviews and other assistance. President Donald Trump thanked first responders who reached the scene as soon as the gunman opened fire, and offered his thanks and prayers.